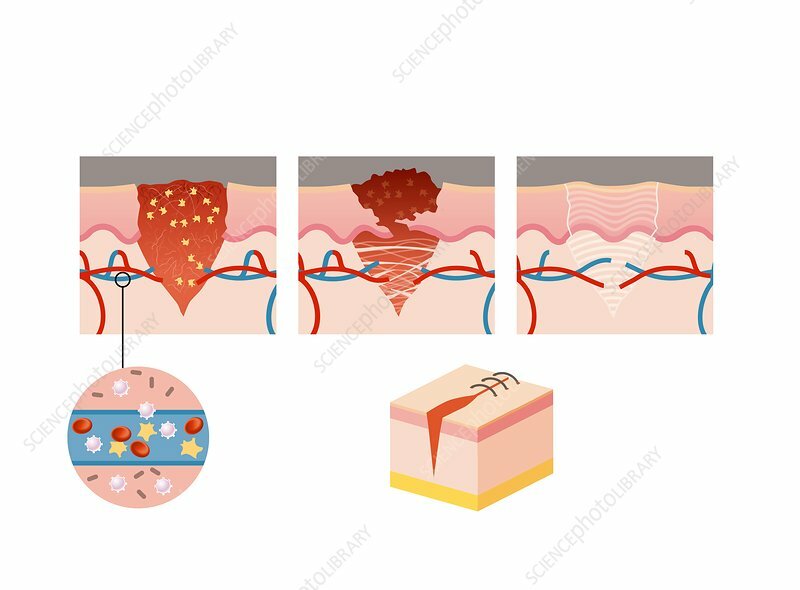 Wound healing, illustration. Sequence from left to right, illustration the process of healing when the skin is cut. At left, blood vessels in the wound contract and release platelets (yellow). These start to form fibrin to seal the wound. At centre, after a few days, the fibroblasts secrete collagen that acts as a scaffold for dermal cells to reconstruct the tissue. Over the next year (right), the skin is reconstructed on this collagen matrix, with potential scarring. The inset at lower left shows white blood cells (leucocytes) as part of the immune response to defend against infection by bacteria and other microbes. At lower right, the inset shows stitches that are necessary for the healing of deep wounds. For this image with labels, see image C042/4372.